Putney Hill is a major residential development in Sydney’s North West. Environmental Partnership has been part of the multidisciplinary team for the project for Frasers Property with our role including landscape strategy development, master planning and landscape design for this complex steeply sloping site site. The new residential precinct provides a range of housing including detached houses, town houses, and multi residential apartment development. Planning was informed by the topography and drainage of the site and the range of important existing trees which have been integrated into the new park system. The Gardens Apartments is the final phase of the Stage 1 development. A central courtyard on two levels is flanked by 3 apartment buildings oriented to maximise solar access. The courtyard levels reflect a formal upper pace with structured seating and formal deciduous tree canopy and an informal lower terrace integrating a turfed green and gardens. The terraces are integrated by a pond system flanked by timber decks which spills to a lower pond. 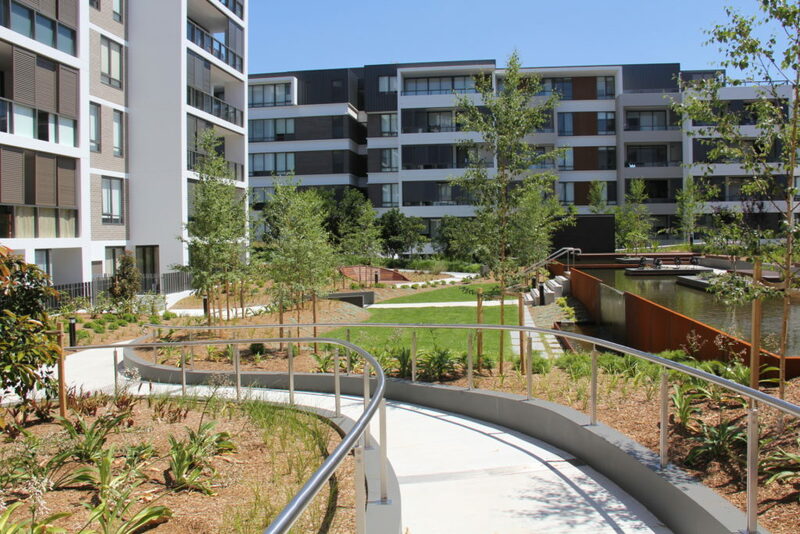 The gardens provide provide a retreat for the residents and Putney Hill community, and a special landscape to overlook for adjoining apartments. Environmental Partnership’s broader work at Putney can be viewed on the Frasers Property Website. More on our projects for Multi-Residential & Estates can be found here.